The feed-and-turn dryer, originally developed for drying very moist maize, is a proven universal dryer used a thousand times. For more than 40 years, it is included in the manufacturing programme of STELA, who introduced this drying principle in Germany. The basic principle of the feed-and-turn dryer has been known for decades and such plants are built meanwhile by numerous manufacturers. can also be delivered "ready to plug in" in mobile design. Hot air is blown through a double bottom - a grid bottom - through the product. A mobile paddle mechanism mixes and conveys the product during the whole drying time. This simple principle guarantees an almost maintenance- and trouble-free drying process. A carriage moves the paddle wheel across the dryer for several times during the whole drying process. The direction is changed by final switches and the respective automatic control system. This combination guarantees an optimum mixing of the product and consequently a constant and homogeneous drying. This system avoids the risk of agglomeration even for heavily polluted or moist products. 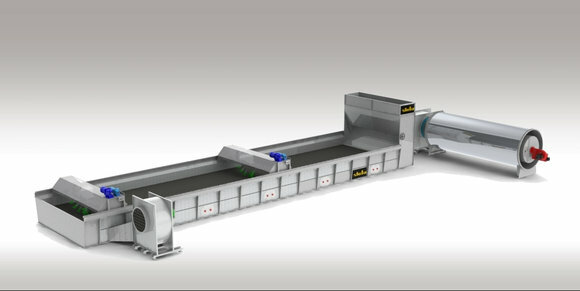 The feed-and-turn dryer can be optimally used for both small and medium-sized product quantities. This is achieved by two different modes of operation: batch drying or continuous drying. Select batch drying for small quantities, i. e. the dryer is filled, then the drying programme starts. If necessary, the product can be cooled after having reached the respective drying degree, then the dryer is emptied automatically. STELA developed a special paddle and drive mechanism for the drying of foliage plants, herbs, grass, pellets, granulates, wood chips, pomace and many similar products. 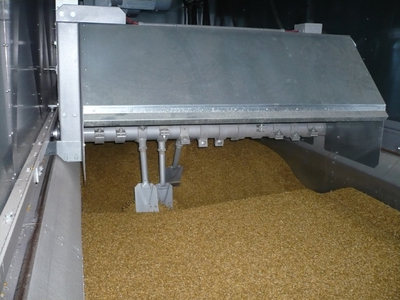 The feed-and-turn dryer with the new paddle and drive mechanism is an excellent alternative for the belt dryer in the medium range of capacity up to approx. 2000 kW.